A third year student and ex-captain of the judo team. Because she does not hesitate to cheat outside of official matches, Nabeshima is known as the "Queen of Fouls" in judo. She despises natural geniuses, such as Akune, and has an interest in Zenkichi, wanting him to join the judo club and succeed her as the team's captain. 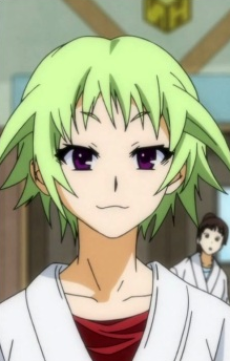 While her devised plot to rid the judo club of Akune and simultaneously have Zenkichi join the judo club fails, she still arranges for Medaka to accept Akune as the secretary of the Student Council and continues to express an interest in Zenkichi. While she does not like admitting it, Nabeshima recognizes that she and Medaka are friends. She has a tendency to avoid situations where she could lose or get badly hurt, so she is regarded as a coward, and is rarely fazed after situations where others are emotionally and mentally scarred. Ten years later, Nabeshima won a gold medal at the Olympics, despite snapping the ligaments in one of her knees. She is now retired, and teaches children in a small judo class. She is working with Aoki Aka towards a possible recovery.